Sterling’s Noah Syer and Woodbury’s Aaron Estrada battle for the ball. Sterling stamped itself as a second-half team in two ways on Tuesday night. Behind senior guard Chris Roe and junior forward Noah Syer, the Silver Knights dominated the last two quarters and beat visiting Woodbury, 62-53, in a Colonial Conference crossover clash of division contenders. Roe scored 27 points and Syer, playing in just second game after sitting out the season's first 30 days, added 15 with three blocks. 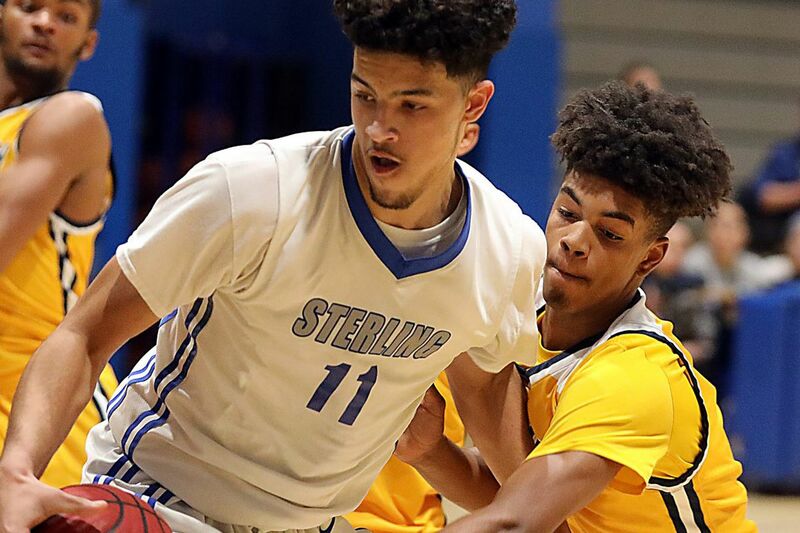 Senior forward Zaboke Streater added 10 points with eight rebounds for Sterling (8-3), which won its fourth in a row. "That's a good win over a good team," Sterling coach Harold Little said. Junior guard Aaron Estrada scored 24 points with eight rebounds and four steals for Woodbury (7-2), the No. 16 team in the Inquirer Top 25. "We needed this game," Woodbury coach Mark DiRugeris said. "This will help us hit the reset button and realize how hard we have to play, how much intensity we need. We can't get nonchalant." Sterling, which has won five in a row, dominated the second half after falling behind by 33-23 at the break. "Coach didn't really say anything," Roe said of Little. "We knew what we needed to do to fix it. We needed to slow the pace, get the ball inside and stop with the mistakes." Roe generated 12 points with a pair of three-pointers and Syer added eight points as Sterling outscored Woodbury by 24-9 in the third quarter. The Silver Knights controlled the paint behind the 6-foot-5 Syer and the 6-foot-4 Streater, and kept springing Row loose in transition. "They must have scored 16 points on run-outs," DiRugeris said. "Our transition defense was bad." Beyond the imposing victory, Tuesday night also signaled that Sterling is a team to watch in the second half of the season. With the return of Syer, who had to sit out under NJSIAA eligibility rules after briefly transferring to Neumann-Goretti in the Philadelphia Catholic League, the Silver Knights have a formidable inside presence to combine with the burly Streater. "He makes a big difference," Little said of Syer. "He's a force in there." Add in the dynamic Roe, who hit a trio of three-pointers and was 4 for 4 from the foul line, plus complementary players such as seniors Kyle Smith and C.J. Barrett and sophomore Evan Gramley — who hit a huge three-pointer to blunt a Woodbury rally in the fourth quarter — and the Silver Knights have the elements to play some meaningful games in February and March. "We have the potential to do something really good," Syer said. "Something crazy." W: Aaron Estrada 24, Branson Blanton 2, T.J. Carter 11, JayShawn Harvey 12, Andre Parker 4. S: Chris Roe 27, Zakobe Streater 10, Evan Gramley 3, C.J. Barrett 5, Kyle Smith 2, Noah Syer 15.